A massive, body-on-frame brute, the Lexus GX 460 is certainly worth your attention if you seek a luxurious SUV that’s so massive you’d swear you were driving around in an armored car. This thing is huge, extremely comfortable, versatile, powerful and, depending on your preferences, stylish. 300-plus horsepower V-8? Check. Heated and cooled front seats? Check. Automatically folding third-row seats? Check. It’s everything you need to take the family out to the wilderness for the weekend while still maintaining a fantastic amount of comfort and luxury. But it’s not all perfect. City fuel economy is pretty dismal, there are some questionable packaging decisions and the drivetrain is devoid of feel. 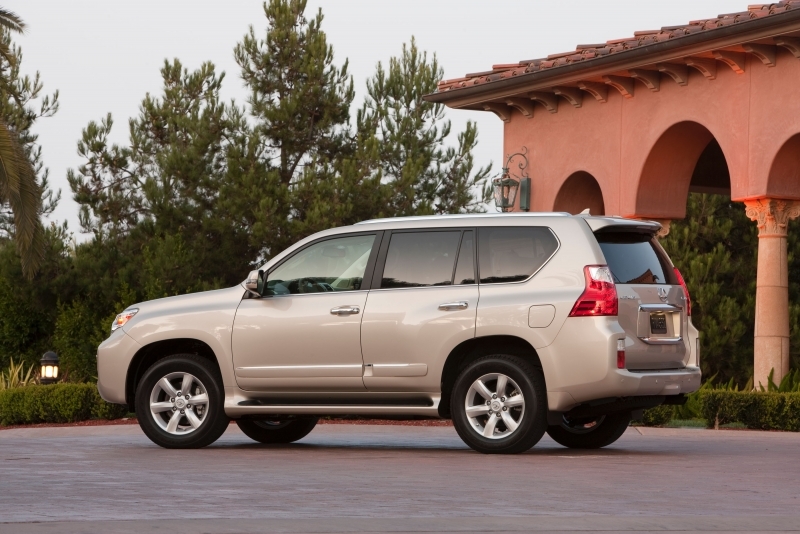 Curiously enough, it also seems to price Lexus’ other massive SUV, the Land Cruiser-based LX, right out of the market. Still, if you’re looking for a large SUV with plenty of comfort dialed in and a large towing capacity, the GX is definitely worth a look. 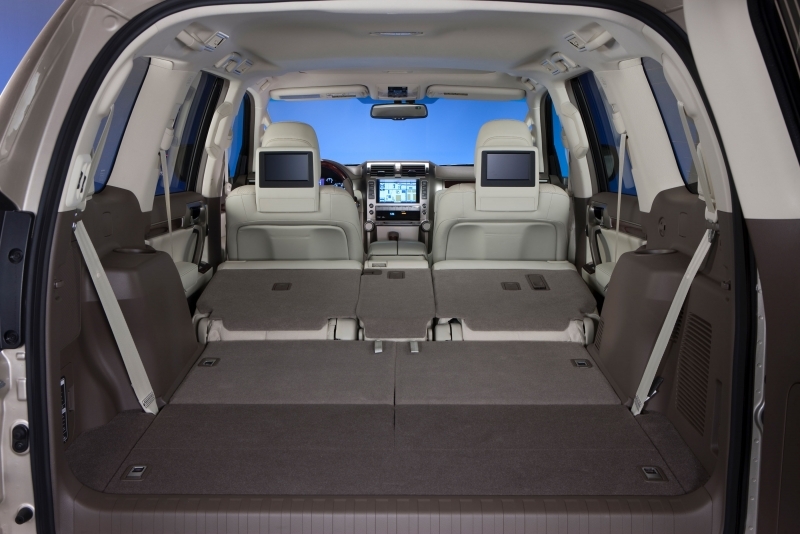 There is a lot of luxury in the GX package, with acres of soft leather and technology crammed into every part of the car. Automatic fold-flat third-row seating is pretty clever, and the 6,500 lb towing capacity is a nice perk. Plus, it has front seat coolers. Need we say more? Fuel economy is pretty dismal, so expect frequent fill-ups. Navigation package seems like something that should be standard at this level, but it remains an option. The touchscreen is a nice feature, but someone needs to fix the iPod navigation interface as it’s impossibly slow to scroll through. Implementing the Remote Touch system from the RX and HS would go a long way as well. 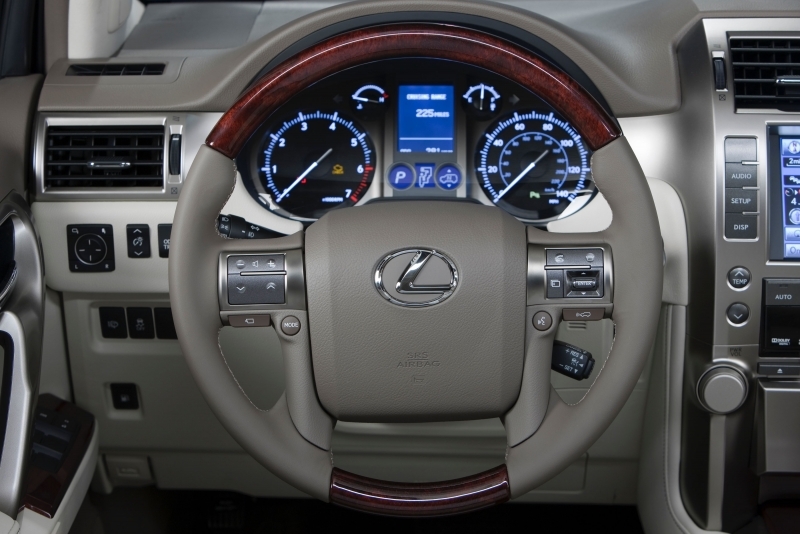 Like most Lexus vehicles, the GX 460 isn’t as much a dynamic revelation on the road as it is a comfortable companion. The steering is light and soft, throttle response is a bit mushy and all around it feels a bit lazy, but what else do you expect of a vehicle this size? You sit high and upright in the cabin, peering out over the massive hood, and everything this side of an F-150 feels smaller than you out on the open road. 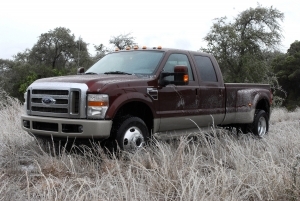 If ‘truck-like’ seating appeals to you, then this is definitely your type of vehicle, and despite its massive stature it isn’t intimidating to drive. The suspension has three modes of adjustability, so you can tailor it to conditions and the length of your journey, but even the ‘Sport’ mode is comfortable for long hauls. Downhill Assist Control is a lifesaver when it comes to getting this behemoth down steep grades, even if you feel stupid using it to get down a driveway. 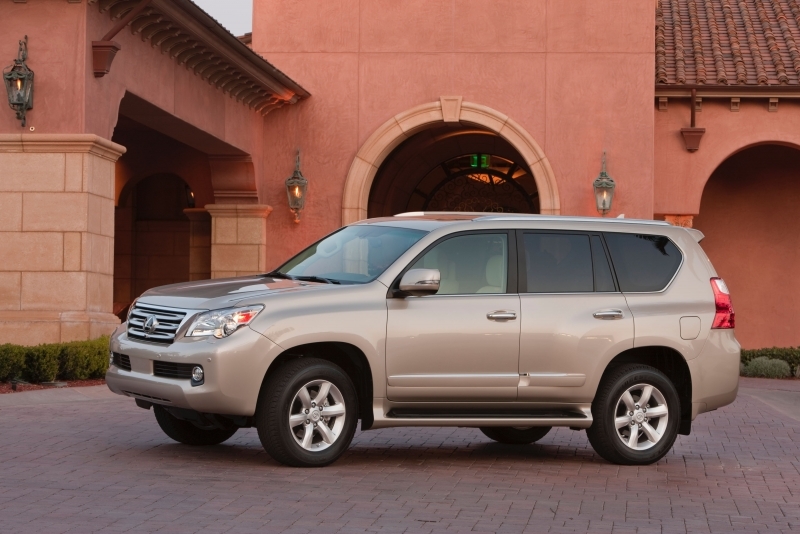 The GX 460 is powered by a 4.6-liter V-8 engine that puts out 301 horsepower and 329 lb-ft of torque. It likes to be revved to make power, but despite the relatively low displacement, it’s more than adequate. A six-speed automatic transmission with manual shift mode drives power to all-four wheels via an electronically locking limited-slip Torsen center differential. The GX features rear height adjustable air suspension, which allows for one of three heights, helping to either clear road obstacles or ease cargo loading. Suspension damping can also be switched between comfort, normal and sport modes depending on how stiff you prefer the ride to be. Some trickle-down off-road technologies such as Toyota’s CRAWL system, Downhill Assist Control and Kinetic Dynamic Suspension System (KDSS), come standard on the GX. The touchscreen for the navigation system is useful, but some of the UI remains questionable, such as the lack of a quick and efficient way to search through your MP3 player library. With one look at this car, you know decent fuel economy is out of the question, but with seven passengers you might be able to justify the cost. At 15 mpg city, 20 mpg highway, you’ll be filling up with relative frequency. Clearly the highlight of the GX, the interior is covered in leather and other high-quality materials that one would expect from Lexus. The power third-row seats (which also fold flat) are especially cool. Taller drivers will find their knee often hits the volume knob and turns off the stereo, which can get annoying quickly. It’s basically a giant box, this thing, and what it might lack in creative style it more than makes up for with imposing presence and sheer size. 18-inch wheels come standard and seven exterior colors are available. The GX 460 starts at an MSRP of $51,970 before destination charges, and once you add a few options that price can balloon to over $60K with relative ease. Key competitors include the Acura MDX ($45,905), Lincoln MKT EcoBoost ($49,200), Audi Q7 4.2 ($61,000), Land Rover LR4 ($47,250), GMC Yukon Denali 4WD ($55,995), Infiniti QX56 ($59,800) and Mercedes-Benz GL450 ($61,950). As luxurious as it is massive, the GX is a good entry in the full-size luxury SUV segment, but it isn’t without its faults. The touchscreen UI is clunky, there are a few ergonomic complaints and the driving experience leaves the driver pretty far removed from the action. That said, it has Toyota’s legendary (up until recently) reliability record on its side.